Chartered Institute of Public Relations (CIPR), London is one of the oldest Institutions in the PR field. They are celebrating their 60th Anniversary this year. To coincide with their 60th Anniversary, they are hosting '5th World PR Conference' at London during June 2008. March 2008 issue of PR-e-Sense focusses on CIPR. Mr Colin Farrington, Director General of CIPR is the Guest Editor of this ezine. We carry an exclusive Podcast interview also with Mr Colin. PR-e-Sense acknowledges the support given by Mr Sudhakar More, National Creative Director, Sudler & Hennessey, Mumbai, India for designing the new logo and the new layout which is being used by us from the Second Anniversary Feb 08 issue. He began his career in the year 1993 with MAA Bozell and went on to work with a number of agencies like Clea, EURO RSCG, and McCann Healthcare. Over the years, he has produced some award-winning work too. His campaign for brand Alaspan (anti-allergic) was recognised as the best campaign of the year among the 40 agencies across the globe in the EURO RSCG group. 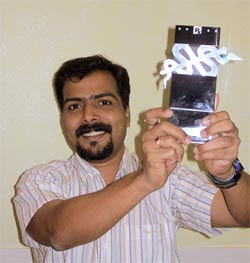 His poster against pirated CDs for Philips won the Gold award at the Ad Club of Calcutta. His poster for OPPI on Responsible Safe Medication won silver at the Rx Club, New York in 2005 and a campaign for S&H won Awards of Excellence. He continued the winning spirit with 2 gold, 1 silver and 15 awards of excellence in 2006 along with a certificate at New York festival for breast cancer awareness poster. And adding the feathers to his cap, he won 2 gold, 2 silver and 21 awards of excellence in Rx club, New York in 2007, creating a name and unique position for Sudler & Hennessey, India globally. PR-e-Sense is proud that the new logo and layout has been designed by such an eminent creative director. PR-e-Sense wishes him many more laurels in future too. PR-e-Sense opens up sponsorship for Corporates! India's first Corporate monthly ezine PR-e-Sense, published by Prime Point Foundation was started in March 2006 with a view to provide quality Corporate information and interviews on various themes. Very eminent people, including Dr Abdul Kalam, (Former President of India), Mr T S Krishna Murthy (Former Chief Election Commissioner of India), Mr Jimmy Wales (Founder, Wikipedia), Mr Colin Farrington (Director General, Charterred Institute of Public Relations, London)have contributed to the ezine. During Jan 08, this ezine got the coveted 'Gold Award' from Association of Business Communicators of India (ABCI), Mumbai under corporate ezine category. Prime Point Foundation and PR-e-Sense organised a Roundtable discussion on "360 degree Corporate Governance" at Chennai to mark the second anniversary of the ezine. The programme was held on Saturday the 1st March 2008 at Hotel Palmgrove. Mr N Vittal (Former Cental Vigilance Commissioner of India), Mr T S Krishna Murthy (Former Chief Election Commissioner of India), Dr U Srinivasa Raghavan (Former Chairman of Indian Postal Services Board), Mr Yogesh Joshi (President, Association of Business Communicators of India (ABCI), Mumbai) were the expert panelists. Ranging from management students to Senior level CEOs participated in the discussions and shared their views. Mr Kiruba Shankar, a well known Indian bloger and podcaster was moderating the discussions in an interesting manner. Second Anniversary issue of the ezine PR-e-Sense was released by Mr N Vittal and Mr T S Krishna Murthy. This issue carries the exclusive interviews of Dr Abdul Kalam and Dr Y S Rajan, duo of India Vision 2020 document. Narrendiran, Sakthi, Selvakumar, Veena, Shvetha and Satish who are associated with the ezine almost from the beginning were honoured with mementoes. Please see the snap shots of the event. The gist of the discussions are given below the pictures. e. Doing business ethically driven by innovation, for profits and to increase shareholder wealth. f. Ethical - do actions based on the following questions, is it legal? is it fair? and will the action cause embarrassment?